Czech truck driver Toma picks up a young hitchhiker, Johannes, with whom he experiences an unforgettable sight on the road. Years later, Johannes, lying on his sick bed, gets the miraculous ability to see the invisible and into the future. Viktor, a Hungarian, travels to a party conference in Berlin and meets there a young Dutch girl Eline. At the same time something irreversible is happening in Gornje Obrinje in Kosovo. What if Viktor could change the fate of the Kosovan village? 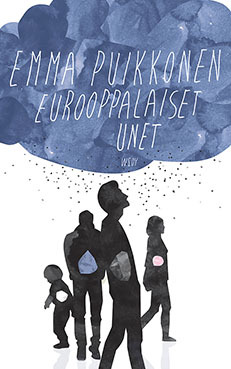 Emma Puikkonen’s novel plays with the idea of life suddenly taking a different turn and changing the course of events. The twists of the recent past and the turns of everyday life of ordinary people intertwine. Each episode contains something surprising and unexpected, which for a short moment makes the reality look different.